We're Rockin' Out In Nature! After a long, dry year our winter storms bring much-needed hydration to our natural environment, but they take a toll on the constructed features of our preserves. A lot of work goes on behind the scenes to make sure the preserves stay safe for visitors and the trails can stay open year-round. 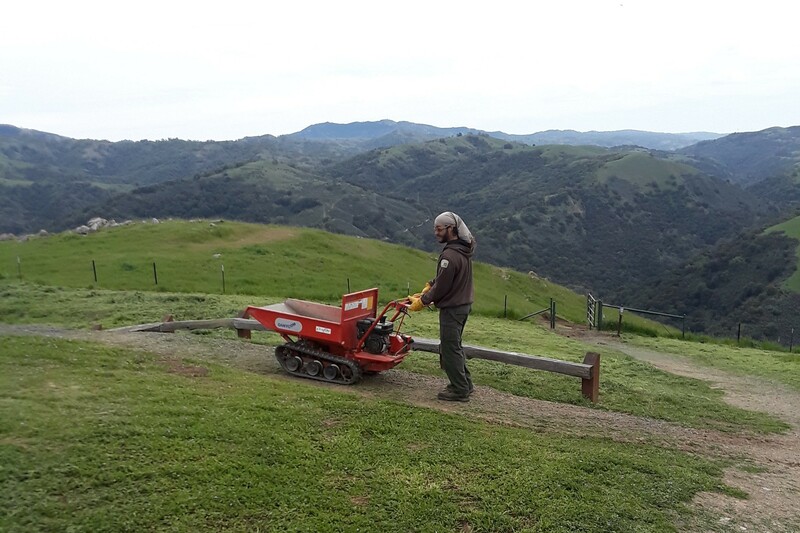 “It is our goal to not have to close down trails due to muddy conditions,” said Megan Robinson, Supervising Open Space Technician. Sometimes, if the rain is back to back with no time to dry out, the Authority must close to bikes and horses, but the field team works through the fall and winter to make sure those days are few and far between. One of the main things the field team does to prepare the preserves for this, is to assess all the trails and harden them against rain. These techniques include "out-sloping,” or building a slight angle into the outer edge of the trail so that when water hits it, it does not stay on the trail or run down the center creating large ruts, but instead slowly falls right off the trail tread and into the grasses below. They also shave off the outer berm, the slightly raised area of the trail tread near the edge of the trail that forms as people walk in the middle of trail throughout the year. This helps water roll, unobstructed, off the trail. As the team monitors these trails, they scan for areas that seem especially prone to rutting, due to the soil type or other conditions that make it more prone to getting muddy and unpleasant to hike on. During the inventory, they flag these sections for future "armoring" of the trail. 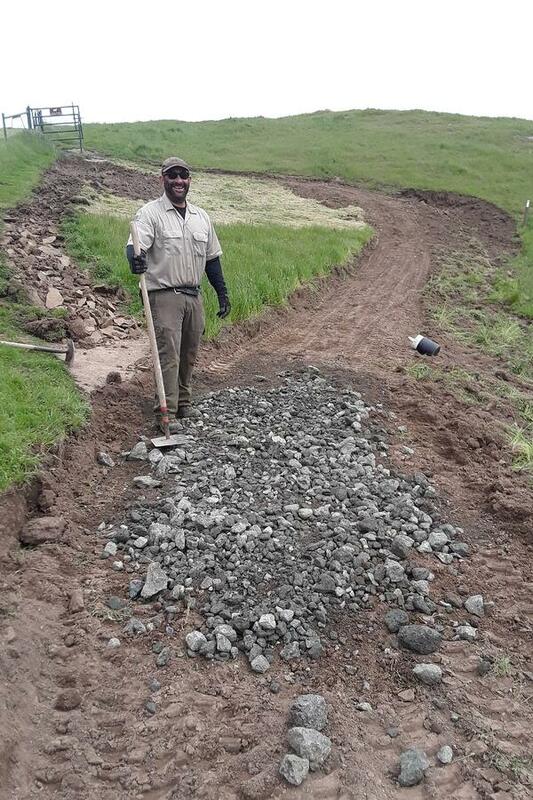 This work involves laying down several sizes of rock to the trail to raise it up, adding a protective layer with a smooth surface between the visitor and the mud. In addition to trail maintenance, the team works through the winter to dig out culvert entrances and exits as well as drainage ditches. This allows for smooth, unobstructed flow of water once it starts to rain. A clogged culvert can become a big problem - it can flood a road and eventually wash it out. It also can allow larger amounts of sediment to be deposited into our creeks, which makes the water too murky for many of the native fish. Additionally, it can add layers of sediment to the creek bed, raising it and changing the natural flow and depth of the creek. Finally, each winter, the field team paints a sealant on all wooden structures such as preserve display boards and picnic benches, and cleans out gutters on all structures. “A big part of winterizing is actually increasing our presence on the preserves during active rain storms. Instead of staying inside, we like to get out in our rain gear and see what the water is doing. It is much easier to assess potential problems during a rain storm then it is to go back after the rain and try to find out what the water was doing, how it was flowing, and what we can do to prevent water flow issues,” says Robinson.